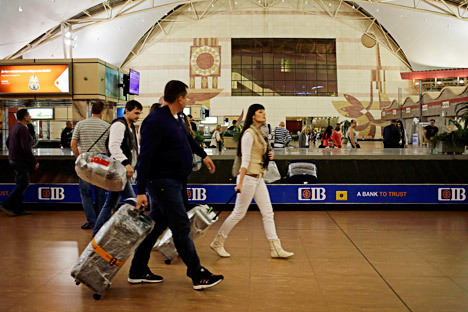 More than 100 tonnes of Russian tourists' luggage have been airlifted from Egypt since the moment air traffic between the two countries was put on hold, the Russian Emergency Situations Ministry press service said on Nov. 10. "Since the moment air traffic with Egypt was suspended five flights have delivered nearly 120 tonnes of personal belongings of tourists who departed from Egypt earlier," it said. On Nov. 9 alone three Ilyushin Il-76 military transport planes of the Russian Defense Ministry and Volga-Dnepr Airlines brought almost 60 tonnes of luggage of passengers of 26 flights from Hurghada and Sharm el-Sheikh to Vnukovo Airport, the ministry reported. "The arrival of an Antonov An-124 Ruslan plane from Hurghada is expected shortly; it will deliver bags and suitcases of passengers of 36 flights," the ministry said. All of the luggage will be unloaded and sorted by Vnukovo Airport services and stored in designated places until it is claimed or transported to other regions.